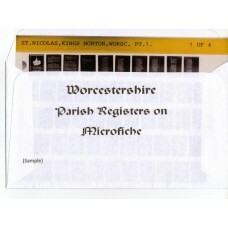 Parish Registers on microfiche Upton Snodsbury, St. Kenelm; Baptisms, Marriages & Burials 1577 -1837 Please note: Microfiche r..
Monumental Inscriptions on Microfiche Upton Snodsbury, St. Kenelm’s Church Also available as a downloadable pdf file There is no d..
Monumental Inscriptions on Microfiche Warndon, St. Nicholas’ Church Also available as a downloadable pdf file There is no date per..
Parish Registers on microfiche Wasperton, St. John the Baptist; Baptisms, Marriages & Burials 1538 - 1837 This data is also availab..
Monumental Inscriptions on Microfiche Webheath, St. Philip’s Church Also available as a downloadable pdf file There is no date per..
Parish Registers on microfiche Wolverley, St. John The Baptist; Part 2. 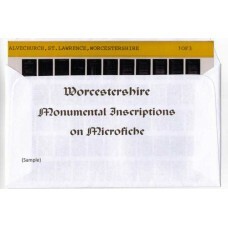 Baptisms & Marriages 1760 -1837 & Burials 1761-1837 Also ..
Census Transcripts on Microfiche Worcester City (North) 1851 Census; Transcript and Surname Index; Please note: Microf..
Census Transcripts on Microfiche Worcester City (West) 1851 Census; Transcript and Surname Index; Please note: Microfi..
Parish Registers on microfiche Worcestershire Land Owners Return, 1873; Please note: Microfiche require a microfiche reader to..
Monumental Inscriptions on Microfiche Wychbold, St. Mary De Wyche Also available as a downloadable pdf file There is no date perio..
Parish Registers on microfiche Bushley, St. Peter; Baptisms & Marriages 1538 -1812, Burials 1538 -1680 & 1696 -1812 Also availab..
Monumental Inscriptions on Microfiche Bayton (Nr. 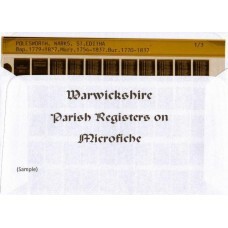 Bewdley), St. Bartholomew’s Church Also available as a downloadable pdf file The..
Census Transcripts on Microfiche Kingswinford 1851 Census - Transcript & Surname Index; Vol. 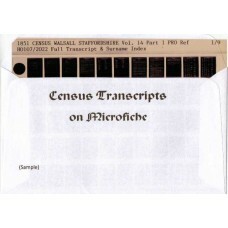 1; Surnames A - Ladd P..
Census Transcripts on Microfiche Kingswinford 1851 Census - Transcript & Surname Index; Part 2; Surnames Ladd - Z &..